Teyana Taylor dishes on her new album, the Aaliyah biopic she almost starred in, and Pharrell. Teyana Taylor has a lot going on right now. The G.O.O.D music singer just wrapped a tour with August Alsina in September and last Tuesday she dropped her first studio album “VII.” One thing you won’t see Teyana Taylor dabbling in, though, is the upcoming Aaliyah biopic. While Teyana is a diehard Aaliyah fan — and not a bad actress — she has no interest in stepping near the Lifetime movie. And after seeing the backlash, that clearly was a good move. Check out what Teyana had to say about not sending in her audition tape, the significance of her album title, “VII,” and her relationship with Pharrell after stepping away from his label. Stream Teyana Taylor On New Album Not Doing Aaliyah Biopic Madamenoire. Watch and download using your PC and mobile devices. MadameNoire | **Madame Noire** is a passionate, cutting-edge web publication geared towards African American women. (Parent Company: Moguldom Media Group). Categories: External, externals, Galleries, Madame Noire, Madame Noire, MadameNoire, News, Reality Report, Reality TV, Slideshows. View Comments. music, pharrell, teyana taylor ... ENJOY ALL THE FEATURES OF UPLIKE! INSTALL THE APP, IT'S FREE. MadameNoire Madame Noire is a sophisticated lifestyle publication giving black women the latest in entertainment, love, news, beauty, hair, and health. Did Karrine Stefans Throw Shade At Christina Milian Over Lil Wayne? On Sunday, "The Real Housewives of Atlanta" and "Celebrity Apprentice" star Kenya Moore took to Twitter to slam Oscar-winner Lupita Nyong'o for not agreeing to take a ... yet to respond to Moore's Twitter diss. ‘Sorority Sisters’ Star April McRae Issues Inspirational Instagram Response to AKA Suspension? Common and John Legend repped Hip-Hop beautifully at this year’s Golden Globes. The former G.O.O.D. Music label mates won a Golden Globe for the song “Glory,” from the Selma soundtrack, in the Best Original Song in a Motion Picture category. 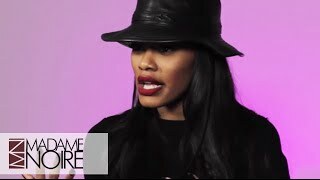 Teyana Taylor on being In Love + People Dragging her into Negativity!